JioFi 999 offer has slashed the price of the JioFi M2S hotspot by 50 percent, down to Rs. 999, to make it a more attractive buy for consumers. The offer is valid on both online and offline stores, Anyways, as you all know JioFi wifi device comes very handy when we don’t have 4G enabled phone. Even those who doesn’t have dual sim but want to enjoy Jio free voice calling can use this amazing device. It easily fits inside your pocket and gives you wifi hotspot anywhere you want. 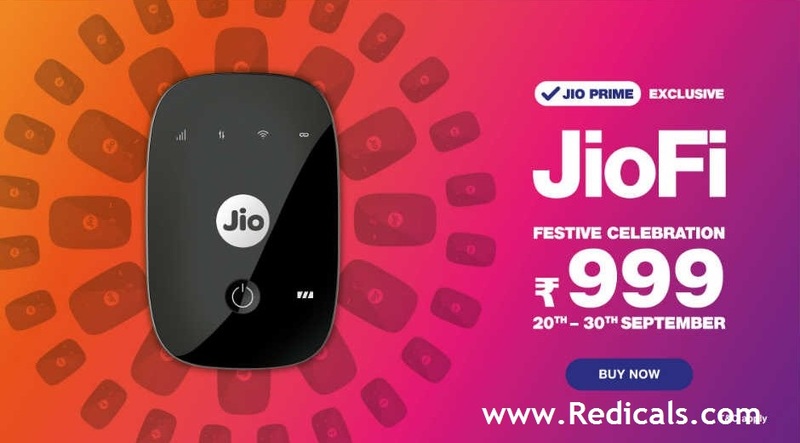 Since Jio has completed 365 days in Indian market, Reliance is conducting a special festival and as a part of it, they are giving JioFi wifi device at discounted price of just 999 Rs. Let me tell you, actual price of this device is 1999 Rs. That means, you are getting flat 1000 Rs discount during this sale. Just go to their official jio.com website & there you will see the slider of Jiofi device. Then enter your pin code to check the availability. We tried it on our pincode & it showed shipping charge as 99 Rs. So it is not really worth. Don’t worry, we have another solution for you! On Amazon JioFi M2S 150 Mbps router priced at ₹ 999 you can expect delivery within 2-4 days. Those having prime membership will receive it within a day or two. JioFi 999 Rs offer is valid only till 30th September 2017. As we all know well about the Jio internet networks and in JioFi its is much more speed and now with 4G internet reaching 150mbps and you can download any on the internet with the speed of 150mbps and even can upload any file to the server up to 50mbps. So don’t fear much of speed as it remains more speed than earlier as the network has built strong and its growing more and more. Now even when you are operating the computer with the access to the internet and you don’t need to worry about the 2G/3G phone for making calls even when you are accessing the internet. Yes, be the boss by buying JioFi 999 and offer internet to the other devices with the assistance of JioFi. Yes, you can share the internet at the same speed and are you in dilemma till how many other devices you can get connected. Then as many as 10 devices you can connect and share the internet with the aid of JioFi. Have you ever faced the problem of charging for your mobile or any other electronic devices? Absolutely right, yes you may have faced the issues or problem with the charging and now it won’t be more required. Yes, with the assistance of JioFi, its connect your other devices and you can carry this lighten, stylish and smart device with you which allows you to connect battery power and make it full. Yes, JioFi has 2300mAh excellent battery storage capacity. It has the capacity to with stand for 5-6 hours and you don’t need to charge all the day. Charge for only a few times and get full battery backup with JioFi. Reliance Ambani declared that there will be much more surprises for this Dasara Festival and in every home there will be full lighting of happiness and he announced its officially JioFi 999 Festive Offer from which every customer can enjoy when they got to claim this surprise festive offer and considered as Reliance Jio Festival Offer.